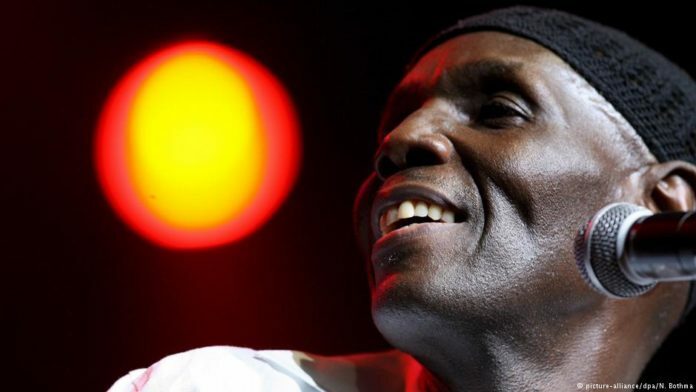 Zimbabwean iconic music Legend Oliver ‘Tuku’ Mtukudzi died Wednesday afternoon the 23 of January at Avenues Hospital in Harare Zimbabwe’s capital. Mtukudzi passed away at 66 years of age after battling with ill-health for quite some time that led to the cancellation of his music concerts around the world as a result. He is a legend in the passionate cross-genre Afro-jazz music who learnt the guitar by himself, his music crossed continents and created a huge fan base around the world. The prolific artiste made more than 60 music Albums including his famous song Todi Shona describing how HIV/AIDS epidemic have ruined communities in Africa and the World. His songs also conveyed messages that includes alcohol abuse and encouraging self-respect in people. Zimbabwean lawmaker Tembo Mliswa on his twitter page appealed to the president to allow Mtukudzi be celebrated as a hero in Zimbabwe. Some experts, classified Mtukudzi alongside Salif Keita and Youssou of Senegal for his influence and innovation through his music while Forbes magazine rated him among the 10 most acceptable artistes in Africa. Mtukudzi also rose to prominence after his roles in defending human rights, generosity and his services rendered while working with UN children’s charity UNICEF as a goodwill ambassador. Mtukudzi musical work was nicknamed ‘Tuku’, his music featured a mixture of ethnic style that includes drew on, diverse instruments like Zimbabwe’s mbira, a metal-tined hand held instrument and South Africa’s Zulu-rooted mbaqanga. He was known to be a humble, generous, loving person and down to earth despite his prominence. May his soul rest in eternal peace.